I don't know of any details about the image, except for the fact that I found it while going through storage in my house. It was originally taken on an instant camera, so I had to scan it to get it here. The picture is probably faded a bit due to age. It seems to be a woman sitting in a chair staring right at you. Creeeeepy. I love this pic. To me it looks like a person sitting in the chair next to it. 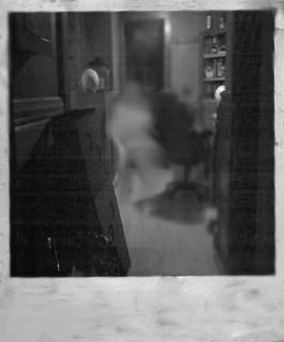 So maybe its a ghost and that was there chair and maybe it used to be where the ghost is. It kinda makes sense, like a residual haunting when a ghost doesn't know what's going on around them. OMG it looks like the man is sitting in a chair. I got a picture like that when I went to St. Augustine. You can see the outline of an human body.